Why Use Comfort Ratings? Comfort ratings give you a starting point when determining what insulated clothes, boots and gloves would be ideal for your situation. RefrigiWear products stretch across many temperature zones so these comfort ratings can guide you in the right direction. In fact we have a range of -60°F (Extreme Softshell) to 0°F to 30°F (Softshell, Fleece). 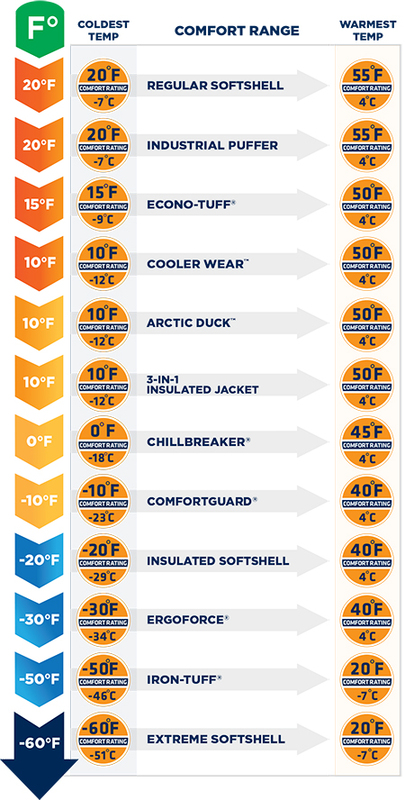 When you need insulated clothing, start with the comfort rating. How Are Comfort Ratings Determined? We have many ways to determine what the comfort rating should be on a specific product from scientific testing to firsthand experience. Our product lines and insulation packages are temperature tested in a research facility but we also have over 65 years of experience and knowledge in manufacturing insulated clothing. In fact, nationwide team visits customers using refrigerated environments everyday to gain firsthand experience with what workers and consumers face in the cold. We combine our scientific testing, on-the-ground experience and years of knowledge to determine comfort ratings so we can help customers determine the best products for their situation. Personal Factors Can Affect Comfort Ratings Comfort ratings serve as a guideline, but there are other factors that can affect whether that garment will be too warm or not warm enough for you. One of the biggest factors is your activity level. You may need something with a warmer comfort rating if you are sedentary versus someone who is actively moving around. For example, if you are in a 0°F environment you may need something that is rated to -20°F if you are not actively moving around. Another factor to consider when selecting a comfort rating is the other elements impacting the environment, such as wind and rain. For example, the temperature in a refrigerated warehouse may remain constant while temperatures in alpine conditions may change considerably based on wind and precipitation. In these latter conditions, the comfort rating of your insulated clothing may need to be warmer than just the air temperature. You will also want to consider the windproof and waterproof properties of clothing you wear in colder weather and working environments.